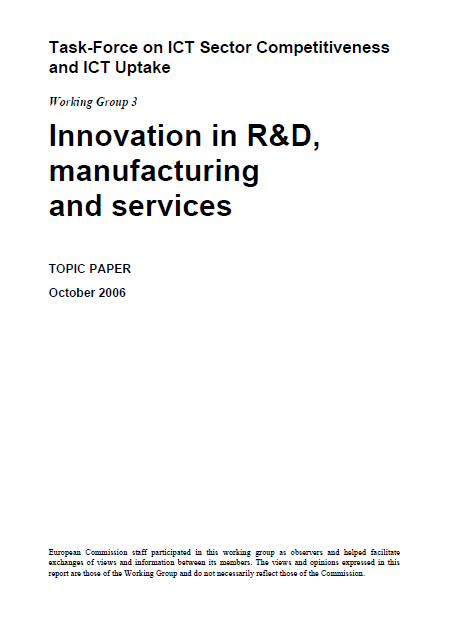 Innovation and R&D and Manufacturing and Services and Human Dimension of Innovation. The EC ICT Task Force Work Group 3 members confirm that innovation in ICT is crucial for Europe’s competitiveness, social and economic growth. Innovation in ICT must be supported by strong political leadership at all levels: pan-European, Member State and regions. 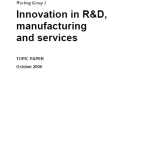 Moreover, Task Force members firmly believe Europe needs a strong “Push-Pull Innovation policy”, in part by supporting and carrying forward the key actions announced in the recent EC Communication on Innovation and the “Aho Report- Creating an Innovation Europe”, and the additional measures presented by Task Force members in the following chapters. It must be noted that in general, the European Union has a number of strategic advantages including its worldwide leadership in ICT equipment and services, which must be better leveraged to respond to Europe’s current social and economic challenges. For example, Europe today has excellent ICT infrastructure with over 80% broadband territorial coverage, a skilled population, technology know how in key areas such as telecommunications, consumer electronics and semi-conductors. Europe however also has a number of social and economic challenges including an ageing population, high expectations with regard to quality of life in particular in healthcare, environmental and transportation concerns. ICT provides a number of solutions to respond to these challenges, and the leadership, technology know-how all remain available within Europe’s borders. Posted in Communications, Global - Europe, Information, Innovation, R&D Commercialisation, Technologies and tagged ageing population, Broadband, Consumer Electronics, EC, Europe's Competitiveness, European, Human Dimension, ICT, ICT Innovation, Innovation, Manufacturing, R&D, research and development, semi-conductor, Services, task force, Technology, Telecomunication.